For week 8 of my 12 weeks of Christmas Cookies I am featuring Cherie’s Snickers Peanut Butter Cookies. My neighbor and friend, Cherie, is famous for her Snickers Peanut Butter Cookie. 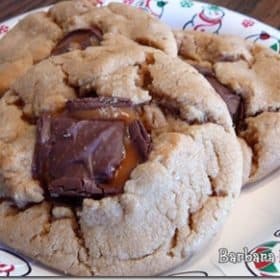 They are a large chewy but tender cookie loaded with peanut butter, peanut butter chips and topped with a mini Snickers bar. Cherie and her family are moving this week, but before she left she brought me a plate of her scrumptious cookies, which she made with Milky Way instead of Snickers because she remembered Milky Way are my favorite. She is so sweet and we will really miss her and her family. She graciously allowed me to share her fabulous cookie recipe with you. Cream butter, sugars and peanut butter. Add eggs. Add flour, soda and salt. Mix well. Stir in peanut butter chips. Roll into balls. Adding the snickers can be done anyway you like. You can place the dough balls on your cookie sheet and press a Snickers mini, whole or cut in half, into the ball and bake. You can chop the Snickers into pieces and add it to the dough, roll into balls, flatten with fork and bake. You can roll into balls, flatten pretty thin and wrap the dough around a whole Snickers mini and bake. If you have mini muffin pans, you can fill it with dough balls and press a mini Snicker into it and bake. Or any other combination you can think of. However you decide, bake at 350 for 10 – 12 minutes. Tips from Amanda of Amanda’s Cookin’: Remove from oven and leave cookies on cookie sheet for 2 minutes to rest. Slide parchment with cookies onto cooling rack and let cool for ten minutes. Remove from parchment to cooling rack to cool completely. If you try to eat these cookies while still warm they may fall apart. Allow them to cool completely and they’ll be fine. Pay close attention to the cooling section or your masterpieces will fall apart before your very eyes. Darn, broken cookies, better eat those… oh don’t worry though, I’ve heard that if you break a cookie,the calories fall out (snort). These look delicious! Just checking before I start baking these – At the start of the baking instructions it says “Preheat oven to 325, but at the end it says “Bake at 350 for 10-12 minutes? Which is the correct temp.? Thanks very much! Thanks for the headsup. I updated the recipe.